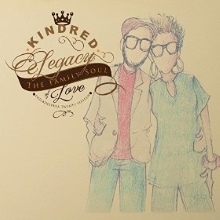 Husband and wife Fatin Dantzler and Aja Graydon seemingly came out of nowhere in 2003 to release what was likely the most critically acclaimed soul album of that year, Surrender to Love, under their moniker Kindred the Family Soul. Sounding something like an updated Womack and Womack but with the underlying joyousness of Ashford & Simpson, the duo was a breath of fresh air as they sang of their deep love for each other and their family, even while acknowledging the challenging, often monotonous existence of daily life. Kindred was formed in the late 90s by Dantzler, a noted soul music writer, and Graydon, a fine singer. They began writing together, covering themes not generally covered in modern R&B. Their lyrical thesis? "There is more to a relationship than just the hook-up and the break-up. Most R&B songs are either about â€˜I just met you and I'm falling in love or I'm done with you and what the hell happened to us?' But there's nothing in between. No room to talk about things outside of lustful love, the temptations and the profundity of love. There's also the beauty of relationships and what they can bring about and what emerges from them." The duo married in the late 90s and began performing around Philadelphia. They became friends with Jill Scott and she helped them land a contract with Hidden Beach Records in 2003. Following the great critical success of Surrender to Love and the smash hit "Far Away," equally great anticipation arose for their follow-up album, In This Life Together, inspired by and named after the autobiography of Ossie Davis and Ruby Dee. The disc was released in October 2005. They followed with the excellent The Arrival, 2011's Love Has No Recession and 2014's A Couple Friends, solidifying their position as the voice of a generation of music fans working to keep relationships, family and romantic love alive.